A.J. Huffman is a poet and freelance writer in Daytona Beach, Florida. 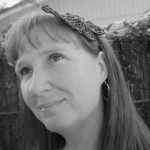 She has previously published three collections of poetry: The Difference Between Shadows and Stars, Carrying Yesterday, and Cognitive Distortion. She has also published her work in national and international literary journals such as Avon Literary Intelligencer, Writer’s Gazette and The Penwood Review.